The world’s largest population of Yelkouan Shearwaters on Tavolara Island, Italy has officially been declared free of invasive rodents due to a successful conservation intervention. Yelkouan Shearwaters (Puffinus yelkouan) are small black-and-white seabirds which breed and nest on islands throughout the Mediterranean. Tavolara Island, located off the coast of Sardinia, Italy is one of the most significant nesting grounds for the species and hosts an estimated one to two-thirds of the world population. Almost all known colonies of Yelkouan Shearwaters, including the population of Tavolara Island, face the same threat – invasive (damaging) species. 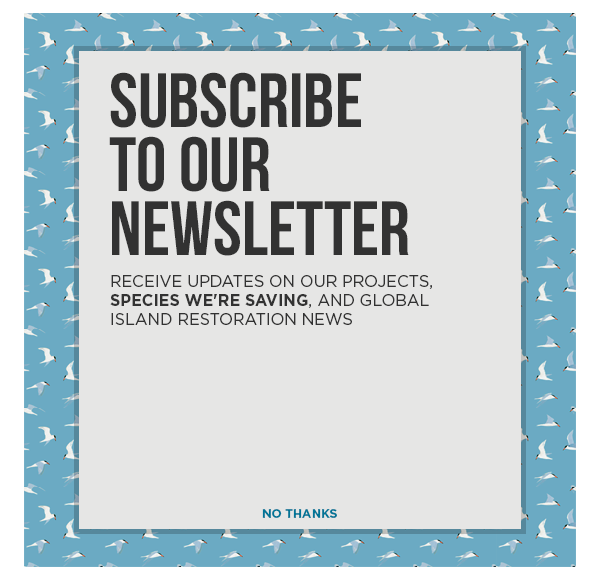 Invasive species have historically posed a serious threat to island wildlife with 86% of recorded extinctions linked to invasive species have occurred on islands. Since islands are home to 19% of the world’s avian biodiversity, this poses an even more serious threat to seabirds around the world and makes invasive species one of the leading causes of extinction for seabirds. A monitoring program that took place from 2006 – 2011 found that all examined nests were predated by invasive rats and the only nests that remained safe were located on sheer cliffs which are inaccessible. Luckily, there is new hope on Tavolara Island. Due to a conservation intervention by Città di Olbia, Life Puffinus Tavolara, Natura 2000, Ministero Dell’Ambiente E Della Tutela Del Terrirorio E Del Mare, Area Marina Protetta Tavolara Punta Coda Cavallo, Nature Environment Management Operators (NEMO), and Island Conservation to remove invasive rodents, the Yelkouan Shearwater population can now thrive once again. Now that invasive rats have been removed from the island, researchers expect a 5,000-8,000 increase in the number of fledged juveniles each year. This is likely greater than the number of juveniles currently fledged each year by the global population of Yelkouan Shearwaters. Although Yelkouan Shearwaters were considered to be the main focus of this restoration efforts, the project will also benefit other species that could potentially breed on the island including Mediterranean Storm Petrels (Hydrobates pelagicus melitensis) and Scopoli’s Shearwaters (Calonectris diomedea). For decades, scientists have also suspected that the smallest mammal in the world, the Etruscan shrew (Suncus etruscus) which weighs 3 grams as an adult was present on the island due to its wide distribution on nearby islands. Despite extensive efforts, it was never detected prior to project implementation. There were signs of the species including bone remnants but no live shrews were found. Two Etruscan shrews (Suncus etruscus) have been located on Tavolara Island which suggests a thriving population after the removal of invasive rodents. Now that the island is free of invasive rodents, our partners at Nature Environment Management Operators tried once more to locate the shrew and with great success, two shrews were captured. This is a great sign for the species since their elusive nature makes them difficult to catch, finding two suggests the species is thriving in the absence of invasive rodents. The completion of this operation is an important stepping stone for island restoration projects in the region moving forward. Island Conservation has been proud to be a part of this project and looks forward to watching the island recover.